To download an executive summary click here, or download from the end of the page. IHRC is pleased to announce the publication of its inaugural study to its ongoing project investigating issues of hate crimes and discrimination as experienced by Muslims in the UK and Europe. The study gives special attention to the Islamophobic and racial motivations for such crimes and goes beyond merely looking at major criminal acts, such as murder and other forms of violence, and considers the environment in which such acts may be encouraged and legitimised. This includes factors such as discriminatory legislation resulting in social inequality in jobs, housing and social services, among other things, as well as negative media representation of Muslims. The study’s adopted methodology is outlined and illustrates the sample group under study in light of the wider demographic scheme of Muslims in Britain. 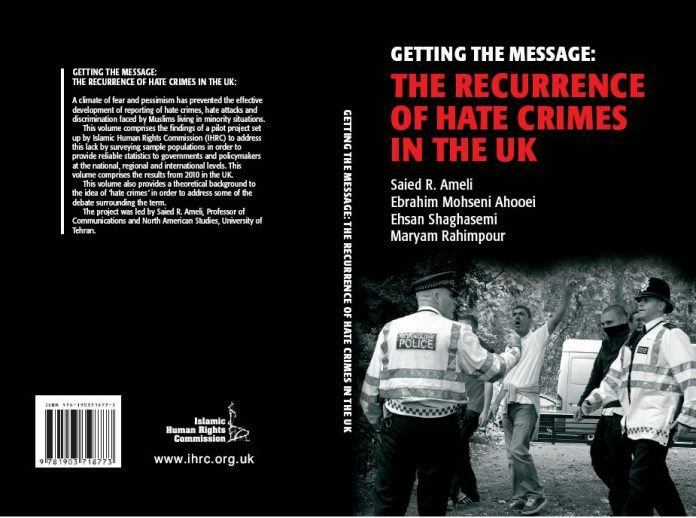 Hate crimes faced by British Muslims are considered in detail, with focus given to explicit and implicit forms of racial and religious discrimination. The study was conducted so as to consider the effect of demographic values on such hate crimes. Also, the survey group was given the opportunity to freely express their views regarding the causes of hate crime and what can be done to combat the problem. This provides a platform for hate crimes victims to voice their perceptions of the problem, which remain otherwise muted. Among the study’s findings, 74.5% of respondents reported to have heard hostile remarks being made about Islam, 66.9% have witnessed negative stereotyping of Islam in the media, and 54.1% have experienced being expected to fit into stereotypes. Additionally, a significant minority of 13.9% reported having been subjected to violent physical assault. The most frequently experienced by Muslims are witnessing negative stereotyping of Islam in the media (66.9%), being stared at by a stranger (44.4%) and witnessing political policies affecting Muslims negatively (37.8%). Among the effects of demographic values, the study found that female respondents were more likely than males to have experienced being ignored in public places; male respondents were more likely than females to have experienced being avoided or being talked down to; and the elderly were more likely than all other age groups to have experienced being treated in a superficial manner. The study concludes by putting forth recommendations for reducing the problems faced by Muslims as a result of discrimination. These include recommendations and suggestions both to Muslims and non-Muslims, with a focus on increased political participation of Muslims, the need to challenge negative media stereotypes of Muslims, enhancing awareness and knowledge among non-Muslims and wider society of Islam, Muslims and Muslim practices, and ensuring that Muslim communities are better equipped to tackle social problems among their youth.